Everything is bigger when you're smaller. I used to get so excited about the trip to my grandparents' house in Florida that I'd start counting down the days to our flight weeks in advance. The vacation meant a week of Raphael (in his rattail) and I (in a floral dress) lying on the astroturf of the sunroom, flicking the bellies of the sillouhetted lizards on the other side of the screen and trying to capture them in Dixie cups. My grandpa also had an affinity for cream pie, though "cream" was an understatement. I think we got a new one every night (I'm sure this isn't true)--coconut cream, banana cream, lemon meringue, key lime--all too tall and unnaturally hued. 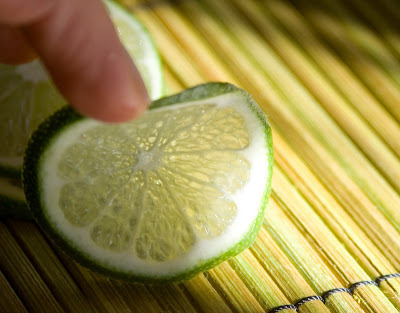 Key lime was my favorite and hard to find in California. It was a once a year treat, just like our vacations used to be--something to anticipate. My memory of my grandparents is fuzzy but intertwined with the memory of key lime pie, which lasts. I wanted to make something comforting--not "comfort food" necessarily--but something I always make. 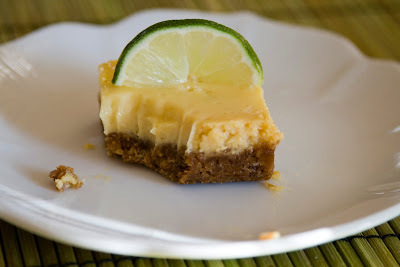 I've been very resistant to putting my key lime pie recipe up. It's not a family heirloom, nor is it any secret at all. I've probably rattled it off to scores of people already. But I've been making it so long and with all my little tweakings and superstitions that it's hard to put into words. OK so this is how I do it: I like it tart so I add more key lime juice than most recipes call for. I use really good eggs, because after all, it is essentially a custard and the eggs are the most important component. Also, the eggs add richness to balance the acid of the lime. I don't have strong opinions on dying the pie, though when you use really good eggs it is hard to achieve that Doublemint gum shade. Sometimes the occasion calls for a green pie, sometimes it's wiser to go au naturel. You could buy a crust but it is sooooo much better to make your own. I like to do a two-part smashing of the crackers, first in a bag with a rolling pin or heavy pot then finishing it with my fingers. I like to have variation in texture of the crumbs, so I don't use a food processor. I also add some ginger cookies or sometimes chopped candied ginger. Just a little. I've also found that baking in a square pan and cutting into bars is better for occasions that aren't sit-down dinners. Mix the crumbs, sugar and salt in a bowl. Add in the melted butter and mix with a fork. Press the mixture into a lightly greased pie pan or 8x8 cake pan and bake for ~10 minutes until lightly brown. Remove from oven and place on a rack. Leave oven on. Meanwhile, whisk the yolks and the sweetened condensed milk in a bowl until well combined. Slowly add in the juice and zest and whisk until combined. The mixture should thicken slightly. Pour the filling into the crust and bake for 15 minutes. Remove and cool completely on a rack. The custard will set as it cools. Once room temperature, chill completely in the fridge for several hours.